https://www.dublinfleadh.com/ All details here - Fleadh Cheoil Átha Cliath Baile Bhailcín an deireadh seachtaine seo...bígí ann! Dublin Fleadh this weekend in St Pauls Secondary School Walkinstown - all details on weblink above. Good luck to our grúpa's bands and competitors! This flute and whistle player is already a much-talked-about performer for her accomplished, energetic, technically faultless and whole-hearted playing. Craobh Naithí Children's Christmas Party will take place in the Ruah Centre in Ballyroan from 3 - 5pm Sunday Dec 10th 2017. Please bring your instruments. Face painting activities and loads of goodies! Described by Matt Molloy as “a remarkable musician”, Dónal McCague from Co. Monaghan was a worthy recipient of the prestigious TG4 Ceoltóir Óg na Bliana award in 2013. Dónal is well known for his vibrant, fresh and unique fiddle style. In 2011 he released his critically acclaimed début solo fiddle album entitled Bits ‘n’ Pieces. Donal McCague: Dónal has twice performed at the Frankie Gavin International Fiddle Festival; Galway 2005 & The National Concert Hall Dublin on St. Patrick’s Day 2006. He has performed on Irish TV programmes such as Fleadh Live, Bosca Ceoil, Geantraí, Imeall & Gradam Ceoil on TG4 and on the Fleadh Programme on RTÉ 1 as well as on national radio. He was won awards at both the Fiddler of Dooney and the Fiddler of Oriel which has been won by Liz Carroll, Liz Kane, Tommy Peoples and Jim Mc Killop to name a few. Dónal is greatly influenced by the fiddle playing of Tommy Peoples, Séamus Quinn, Brian Rooney, John Carty and Frankie Gavin. In recent times, Dónal has recorded on Michael McCague’s album of self-compositions entitled “The Waylaid Man” (www.michaelmccague.com) and also recorded on & arranged the material for “Our Dear Dark Mountain with the Sky Over It”. This album of traditional Irish music features music sourced in the 18th & 19th centuries from the Sliabh Beagh region which takes in parts of counties Monaghan, Fermanagh & Tyrone. The album, which features many musicians from the Sliabh Beagh region, was released in 2014. www.deardarkmountain.com. As well as being an accomplished solo musician, Dónal has substituted for Oisín MacDiarmada in the well-known band “Téada”. He has also performed with the “John Carty Festival Band” and with members of De Dannan, The Chieftains & The Bothy Band as well as with Matt Molloy, Frankie Gavin, John Carty and Arty McGlynn to name a few. Tommy Fitzharris: Multi-instrumentalist Tommy Fitzharris, hails from Stradbally, Co Laois, and has been playing traditional Irish Music since the age of seven. He comes from a musical family and is self-taught on the flute, concertina and whistle. Tommy made a first ever for his county in 2009 when he won the Senior Concertina Title in the All-Ireland Fleadh. In 2012, he then triumphed in the All Ireland Senior Flute Competition winning it also at Fleadh Cheoil na hEireann in Cavan. Tommy has been a tutor on the BA in Irish Music and Dance and on the MA in Traditional Irish Music Performance in the University of Limerick from 2009 to present. In addition, he is in constant demand as a tutor and performer on the traditional Irish music festival scene and continues to give workshops and concerts at various traditional music festivals nationally and internationally. Tommy has toured Europe, the United States and Asia extensively with the band Ciorras who were formed as part of the Lorg Lunny programme on TG4. 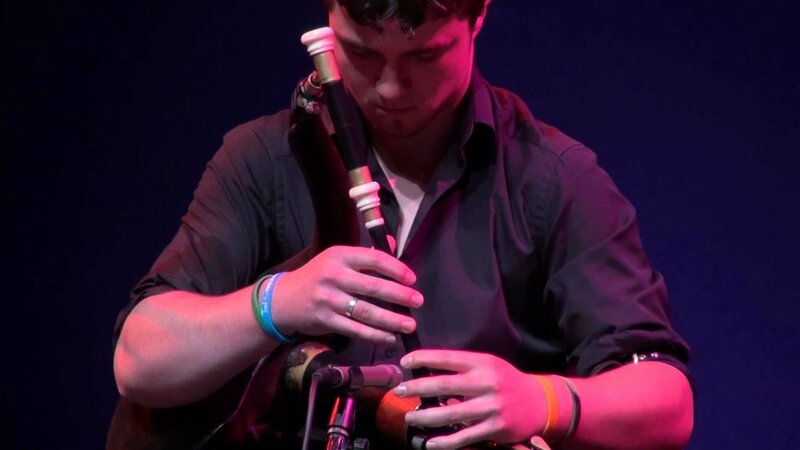 He has featured on the Fleadh programmes, BBC Alba and its annual coverage of the famous Celtic Connections festival in Glasgow, Beijing TV, Geantraí, Ceilí House and The Tubridy Show. He has performed in some the worlds most prestigious music venues including The Forbidden City Concert Hall Beijing, The National Concert Hall in Dublin and the Munich Philharmonie Concert Hall to name but a few. Tommy holds an MA in Irish Traditional Music Performance and a Grad Dip in Music Education, attained from The Irish World Academy of Music and Dance at the University of Limerick. Donal McCague (fiddle) and Tommy Fitzharris (flute/concertina) first met at the Ennis Trad Fest in 2012 while having a few tunes with the great Peter Carberry. Donal is a worthy recipient of the TG4 Gradam Ceoil Young Musician of the Year award in 2013, while Tommy has won numerous All-Ireland titles on both concertina and flute. The duo have performed at numerous music festivals together including at the Tonder Festival, Denmark, in 2014. We are delighted and proud to be able to welcome Dónal and Tommy to perform a recital for Craobh Naithí at the Divine Word Parish Centre on May 20th. Bígí Linn! Our second date for the much anticipated performance of Oisín Morrisson's Clann Lir Suite will be Fri May 5th 2017 in the Halla of Coláiste Eoin / Íosagáin. Clann Lir is a new orchestral suite composed by Dublin based harper and flautist, Oisín Morrison. The suite, an hour long musical portrayal of the Irish legend ‘The Children of Lir’, will be played by Ceolfhoireann Naithí agus Cairde, an orchestra of young traditional and classical musicians. The suite explores the tragic story of the children, depicting their turbulent lives, including the loss of their humanity, their beloved parents and their endurance of the harshest conditions in nature. The music of Clann Lir combines ten movements, representing the different chapters in the family’s life, which eventually culminates in their inevitable reunion in the afterlife. Craobh Naithí are delighted to host a recital night with Liam O'Brien and Hajime Takahasi. A very popular winner of the TG4 Ceoltóir Óg Gradam Cheoil 2017 Award Liam hails from Miltown Malbay in Co.Clare. He is accompanied by music student at the University of Limerick Hajime Takahasi from Tokyo in Japan. Watch the clips below of these two fine musicians. A wonderful nights entertainment is assured. Tonight at the Divine Word Parish Centre Marley at 8pm Martin Gaffney hosts an evening with fiddle player Ben Lennon. From a family steeped in music living near the Leitrim Fermanagh border, Ben began playing fiddle at the age of 10. He lived through the years of the arrival to Ireland of the 78rpm records, which brought the fiddle playing of emigrated fiddle players such as Coleman & Morrison to a local level for those lucky enough at the time to own a gramophone. He has recorded several albums and now teaches at music schools such as The Willie Clancy week and Drumshanbo. He is a brother to Charlie and Maurice Lennon. A very interesting and unique opportunity to hear this special man....cupán tae agus rudaí deasa le nithe ar fáil ag an briseadh! Craobh Naithí 40th Anniversary Celebrations! A social evening - Gala Dinner and Concert - will take place on 15th October 2016 at Fitzpatricks Hotel Kiliney to celebrate Craobh Naithí's 40th anniversary. All are welcome - anyone who has had any affiliation with the branch past or present, to what promises to be a great evening. Drinks reception commences at 7.30pm. Tickets are on sale each Thursday evening at a special ticket desk in the hall at the price of €40 each. They can also be purchased by contacting Derek Johnson directly - 087 2208661 A once in a decade celebration. Comhgairdeachas Craobh Naithí! Daichead Bliain ag fás! The end of year concert takes place this year in St. Colmcilles Secondary School Knocklyon on Thurs 19th May. Please have the children come and practice with their tutors at 6pm and the concert will commence at 7pm. It is free event open to all interested. Childrens Christmas Party today 6th Dec at THE RUAH CENTRE BALLYROAN 3PM games and face painting Santa will visit!!! Arrive at school at 6pm and concert begins at 6.30pm. Every musician will play at the concert as part of their group. Children who are beginning to learn music, and aren't part of a group yet, will all perform together on stage with some of the teachers. They will get a chance to practice together before the concert begins. & on Saturday at door. All proceeds will go to the Hope Foundation to support street orphans in Calcutta, India. Bryan’s cousin, Riona Sparkes, Craobh Naithí U-18 Grúpa, will be travelling to Calcutta with the Hope foundation at the end October. Please support a great evening of traditional music. Registration for classes for September 2015 for new and existing members takes place at the committee desk April 16th 23rd and 30th from 6 - 9 pm. Please advise a member of the committee if you are seeking to join Craobh Naithí and they will be happy to answer any questions and show you around. The committee desk is in the main hall in St. Colmcilles Secondary School in Knocklyon. Marlay Recital featuring Nell Ní Chróinín amhráiní ó Béal Átha an Ghaorthaidh winner of the national Sean-Nós singing competition at this years Oireachtas festival in Killarney. with talented young musicians from Déise - Caoimhín & Seán Ó Fearghaíl who released their CD 'Lá ag Ól Uisce' last year - Seán plays fiddle and concertina, and Caoimhín plays pipes, flute, and guitar. Craobh Naithí Christmas concert at St. Colmcilles Secondary School Knocklyon for family and friends.